While most strategic and political attention has been focused on rising giants China and India, Indo-Pacific Asia’s tiger nations – Thailand, Vietnam and Indonesia – have quietly established rapidly growing economies and strategic partnerships with great powers to support and expand their own regional interests, further complicating Australia’s geo-political and strategic calculations. Despite the post-Cold War claims that competition between nation states was at an end, the emergence of Indo-Pacific Asia as the centre of economic, political and strategic gravity for the 21st century has served to shatter the beliefs of many in the developed world, including Australia. While China and India drew much of the economic, political and strategic attention of the past three decades, a number of ambitious, competitive and increasingly powerful regional great and middle powers have leveraged the obscurity and anonymity to establish themselves as pivotal cogs in the broader machinery of Indo-Pacific Asia's economic, political and strategic ascendancy. Like their larger contemporaries, this cluster of emerging powers have a history defined by a range of religious, cultural, ethnic and increasingly economic, political and strategic rivalries and ambitions that, when combined with the dramatic increase in Chinese and to a lesser extent Indian military capability, has contributed to the growing modernisation and rearmament of the region. While the economic strength of these nations continues to grow, they have continued to leverage relationships with major global arms suppliers, namely Russia and China, with a lesser focus on Europe and the US to establish a range of cost-effective and highly-capable and modern platforms, removed from the political scrutiny that comes with dealing with many Western nations like the US, UK, Australia and France. This geo-political jockeying has served to establish a range of often symbiotic relationships between rising regional powers and nations like Russia, China and to a lesser extent India as they seek to establish favour throughout Indo-Pacific Asia to support their own broader economic, political and strategic ambitions. At the height of European colonisation in Asia, the Kingdom of Thailand maintained its sovereignty, successfully resisting European occupation for centuries despite repeated attempts to capitalise on the nation's strategic location, straddling both the Indian Ocean and South China Sea, while also being at the confluence of major sea-lines-of-communication and strategic choke points like the Straits of Malacca. This lack of colonisation positioned Thailand well to leverage the economic opportunities presented by a globalised economy and the constant search for cheap manufacturing labour, as Thailand sought to maximise economic development opportunities with companies from China, India, Russia, the US and Europe, while utilising a range of economic policies similar to those responsible for the industrialisation of South Korea during the latter half of the 20th century. Thailand's rapid economic growth driven by extensive investment by both the Chinese and Japanese, combined with an ambitious young King, has resulted in a period of military modernisation and restructuring with a focus on securing the nation's growing economic, political and security agenda in south-east Asia. This has resulted in a series of high-profile acquisition programs for both tactical and strategic force multipliers. Both the Royal Thai Navy and Royal Thai Air Force are undergoing a range of modernisation programs, with the Navy acquiring two new DW 3000F multi-role stealth frigates from South Korea combined with a 4 billion baht frigate acquisition agreement with China. Further supporting these acquisition programs, Thailand has also committed to the multibillion-dollar purchase of three Chinese-built S26T submarines. These submarines are designed to conduct anti-shipping and anti-submarine operations in littoral waters, perfect for the operational confines of Thailand's immediate maritime areas of influence, namely the strategically vital sea-lines-of-communication in the Indian Ocean, Straits of Malacca and South China Sea. The RTAF has equally undergone a series of eclectic modernisation programs to replace Cold War-era fighter aircraft with US-built F-16ADF variant and Saab Gripen fighter aircraft. Additionally, both Ukrainian and Chinese armaments companies have committed to investing in Thailand's domestic defence industry through a range of programs, with Ukraine’s state run defence production company Ukroboronprom signing a contract to develop main battle tanks and armoured personnel carriers in Thailand. This is reinforced by an ongoing agreement between Thailand and China to supply VT-4 main battle tanks (MBT) to supplement existing units and Ukrainian-made T-84 Oplot MBT, with additional modernisation and rearmament programs expected as Thai equipment continues to reach obsolescence. Former foe, now a friend? Much of both Australia and the US' engagement with Vietnam is framed through the lens of the politically disastrous and destructive Vietnam War. Despite this, the growing regional ambitions of China, driven largely by illegal island reclamations in the South China Sea, combined with ancient ethnic and cultural enmities between Vietnam and China, have driven once implacable enemies into one another's arms. While not as developed as Thailand, Vietnam is experiencing a period of economic growth and modernisation that is being used to modernise the nation's armed forces to counter the growing pressure, while also enhancing the nation's own strategic ambitions and national security objectives, driven largely by the nation's proximity to the South China Sea's energy reserves and strategic sea-lines-of-communication. This modernisation and rearmament has seen a range of largely Russian-designed and manufactured weapons systems and platforms introduced to support the nation's capabilities to deter aggression and coercion by larger actors, namely China. 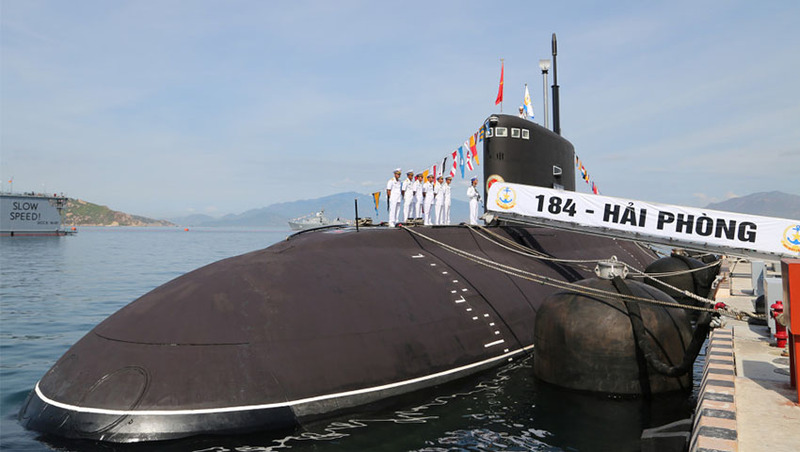 The Vietnamese People's Navy in particular has received a fleet of upgraded, Russian-designed and manufactured Kilo Class conventional attack submarines, which like their foreign counterparts are designed to conduct key anti-shipping and anti-submarine operations in littoral waters. The submarines are supported by a growing fleet of advanced Russian-designed and manufactured Gepard 3.9 guided missile frigates and a range of highly capable missile corvettes, all of which are armed with advanced Russian anti-ship cruise missiles providing a relatively rudimentary, yet effective and highly mobile, maritime focused anti-access/area denial (A2/AD) system. Supporting these impressive maritime capabilities, the Vietnamese People's Air Force maintains a robust and highly-capable fleet of Russian combat aircraft, with a focus on developing a well rounded air superiority, multi-role and fighter-bomber force capable of deterring hostile action. Key platforms include both the Sukhoi Su-27 and Sukhoi Su-30MK2V fighter and fighter-bomber aircraft, supported by Cold War-era Sukhoi Su-22 strike fighter bomber aircraft. Vietnam's proximity to and interests in the South China Sea and historical disputes with China have required that the nation maintain a well-rounded, yet highly capable fighter force capable of competing with larger nations and will continue to form the backbone of its strategic and tactical response to the rapidly changing region. Finally, Australia's major northern neighbour, Indonesia, is rapidly emerging as a potential regional and global power, leveraging its population and geographic location as a hub for regional and global maritime trade, manufacturing and resources development, seeking to overshadow traditional regional rivals, namely Singapore. As with its other regional counterparts, Indonesia's military modernisation is being driven largely as a result of growing Chinese assertiveness in the South China Sea, with a number of territorial disputes between the two nations breaking out. Much like Vietnam, Indonesia is still a way behind its other contemporaries but is emerging as a major regional and global power, with unique geo-political, economic and strategic ambitions and interests of its own. Further complicating this is Australia's constantly evolving relationship with the rising power. While relations have returned to a degree of relative normality following the East Timor intervention and Bali bombings, the underlying tensions driven largely by differing views on human rights and minority rights among others remain, presenting Australia with a unique geo-political and strategic conundrum. As a result, the Indonesian Armed Forces (TNI) are undergoing a series of modernisation and rearmament programs, with each of the branches leveraging cost-effective access to advanced Russian, European and South Korean weapons systems and platforms. In particular, the Indonesian Navy has undergone a major suite of capability modernisation with the introduction of advanced Dutch-designed guided missile frigates and corvettes supported by both South Korean and German submarines to provide a conventional deterrence and sea control component to the Navy's force structure. Indonesia's Air Force has focused on developing a traditional 'high-low' mix of combat aircraft, deploying both Russian and US aircraft, including the highly capable Sukhoi Su-27, Su-30 and Su-35 series fighter aircraft and the US manufactured F-16C/D variants, which will serve as the backbone of the Air Force's air combat capability. Additionally, Indonesia's growing prosperity, combined with its strategic and tactical operating reality have resulted in growing pushes to modernise the capability of the Air Force, with a focus on 4.5 generation platforms and industrial development programs with nations like Russia and South Korea as the nation seeks to expand both the capability of its local defence industrial base and advanced manufacturing sectors and the capability of its own Air Force. For Australia, the emerging capabilities of formerly developing nations, combined with the increased capacity of major global powers like China and India, are serving to radically reshape the way the nation thinks about defence and strategic policy. Further influencing these emerging challenges is the continuing ambiguity around the US and its willingness to act as Australia's strategic ally. As these factors continue to evolve, Australia's role, position and capabilities within the regional hierarchy will need to evolve. In the final part of this series we will take a look at the capabilities and doctrines the nation should consider introducing to support the long-term security and stability of the national interest.